A cop on the edge. A conspiracy on the rise. Nick Conklin (Michael Douglas) and Charlie Vincent (Andy Garcia) are strangers in a strange land. They are New York City cops in Japan., chasing Sato (Yasuka Matsuda) an escaped murderer and member of the Yakuza (the Japanese Mafia). Director Ridley Scott ("Alien",Blade Runner") takes us on a nightmare journey through the exotic, violent streets of Osaka, into the very heart of the deadly Yakuza. From the producers of "Fatal Attraction" and "The Accused," this fascinating thriler tells of men torn by a clash of culture, crime against honour. 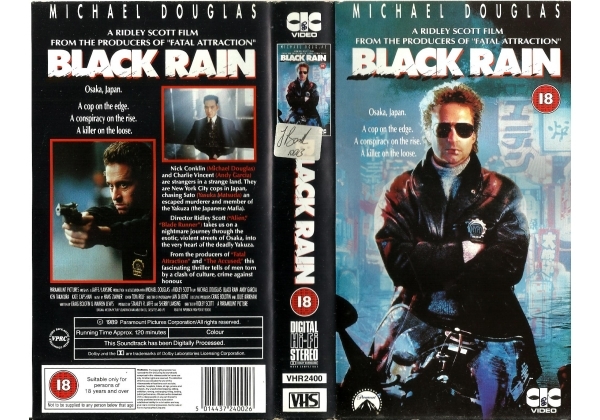 Or find "Black Rain" on VHS and DVD / BluRay at Amazon.